In May, we were invited to the opening of a wonderful new exhibition at the British Museum and with my little ladies accompanying me I was able to indulge two of my great passions in one fell swoop. 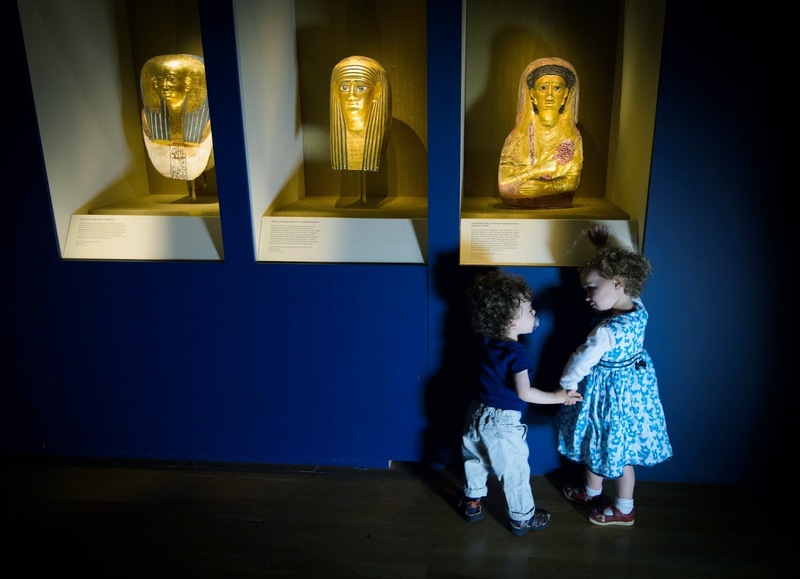 My love affair with Egypt began at Culturebaby's age and I thank Manchester Museum's enthrawling collections for my lifelong obsession. Given that we haven't yet done a huge amount on the topic, nothing could have delighted me more than the first time Culturebaby pointed at my bookshelves and asked for the 'Tukamun One' (a large volume of Harry Burton's photographs of the discovery of the tomb of Tutankhamun) or went to bed clutching her Sphinx-shaped rubber duck. With this burgeoning interest in mind we therefore leapt at the opportunity to attend a press view of Ancient Lives, and our mini reporters loved the experience. On entering the exhibition we encountered the startling foetal skeleton of a man of around my own age who died over 5000 years ago. With awe you see that not only was he older than the pyramids, more ancient than the pharaohs, but Gebelein Man B, preserved directly by the hot desert sand is also still in possession of his skin, hair, nails and beard. With thanks to the care of Wallis Budge's excavation over 100 years ago, we know he was buried with care and grave items by a people who already believed in an afterlife. Culturebaby, with credit to our local Roman museum, once nervous, is now happy to examine skeletons and she identified this natural mummy as such as soon as she entered the exhibition. 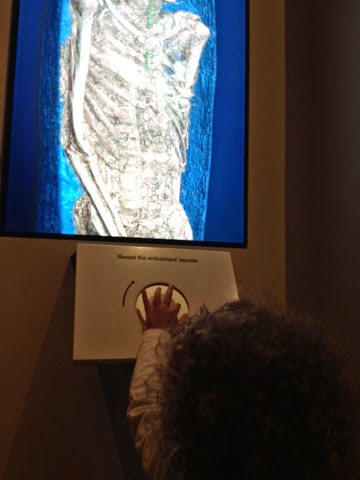 She then realised with delight that in the next room she was able to operate large screens on the walls using a simple touchpad to turn and examine a number of other mummies. 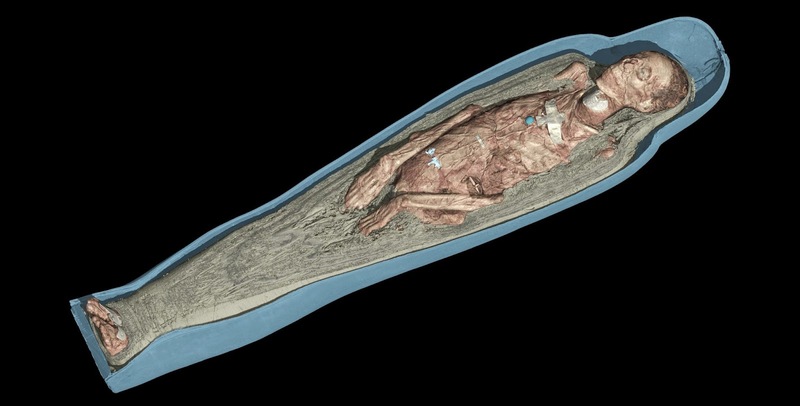 These clever 3D scans allowed us to see below the in-tact wrappings, spot amulets and organs, discover the gender of these ancient people, get clues to how they died and see something of who they were in life. She spent a long time concentrating on these, examining them, turning them. She was rather preoccupied by the fact that one of them was temporarily not in operation, and still mentions it. We may have to go back to see it working. So, through the almost magical animations in the subsequent rooms we saw a number of ancient personalities come to life. We met an older man from Thebes from 600BC who has been carefully mummified and may have been a person of status. He seems to have had trouble with his teeth, and scans tell us had a number of abcesses, which have led to blood poisoning. 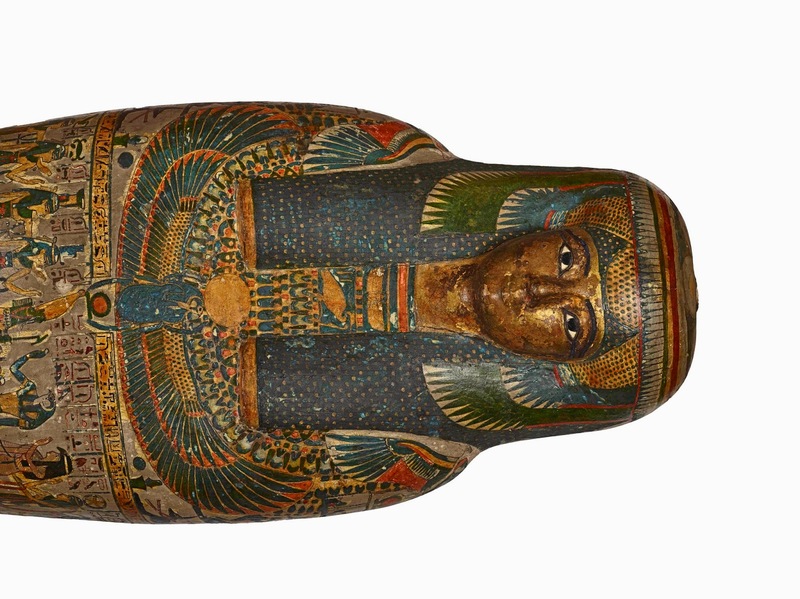 Cartonnage of a priestess, adult, casing with a gilded face named Tayesmutengebtiu, also called Tamut. Then there is Tamut, a high ranking priest's daughter and 'chantress' at Amun's temple, from round 900BC who suffered with cardiovascular disease. She was discovered with her painted coffin over 100 years ago, but now we can finally see inside. She was buried with beautiful amulets, including wax images of the sons of Horus, scarabs and sheet metal winged deities across her heart, feet, and pelvis representing re-birth and protecting her heart in the hall of judgement, and a winged goddess Tamut across her throat to ensure her immortalisation. These are all preserved in situ but have been printed as 3D replicas. On her finger and toe nails are thin metal coverings- probably gold leaf - to reinvigorate her body in the afterlife according to the Ritual of Embalming. Then we meet Padiamenet, a temple door keeper from around 700BC who owns a bright and colourful coffin, which was slightly too small for him. Whoops! 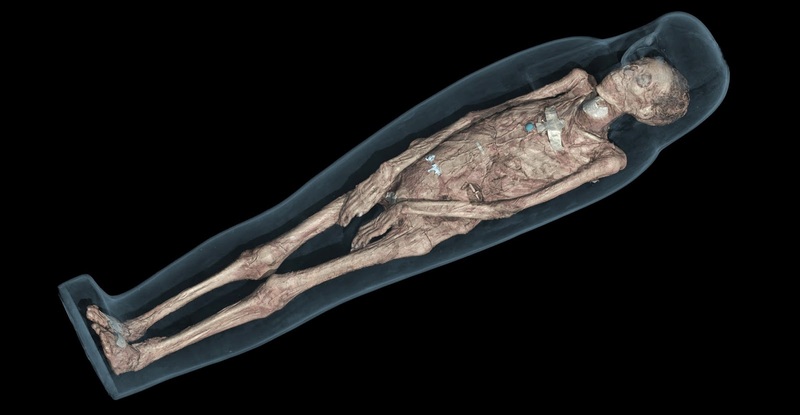 As with mummification in certain periods, most of his brain appears to have been removed through his nose and his chest and pelvis have been packed with other materials. The scan also shows a pole was inserted to stabilise his head which had been removed. The authors of the Book of the Dead would perhaps not approved of this method - the body was supposed to stay in tact. Again he had trouble with his teeth and bones and may have eaten too much animal fat in his lifetime. Next comes Tjayasetimu, a young temple singer of only around 7 years old who was considered important enough to have been (unusually for her age) embalmed. We see her developing teeth and long hair. She has a (rare) wig, beauty items and her harp and clappers, which Culturebaby loved - particularly given that one of her current favourite stories features a little Egyptian girl with a harp (reviewed below). 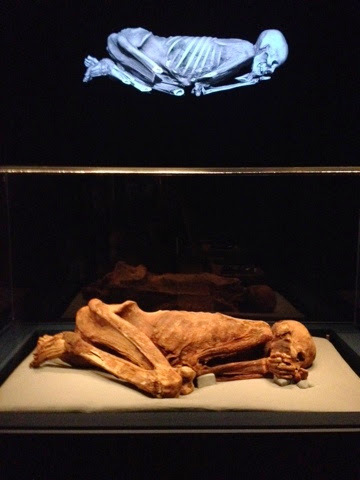 Then there's a very unusual mummy from the Roman period, with his natural hair uncovered and his arms, legs, fingers and toes all individually wrapped with details that are made to look like clothes and jewellery. And a Christian woman from the Sudan around 1300 years ago, who sports a tattoo on her inner thigh of the Archangel Michael, the patron saint of the Sudan. With her we almost return full circle to the first mummy. Her grave was simple and her mummification natural. Consequently her expression is a little disturbing. The most emotive and interesting exhibit on this occasion for both Culturebaby and me was the beautiful but sad little coffin of a little boy of Culturebaby's age. She seemed to recognise that this was a peer and spent a while looking at the scan of his tiny body, which was displayed on a block of perfect height for her to reach. 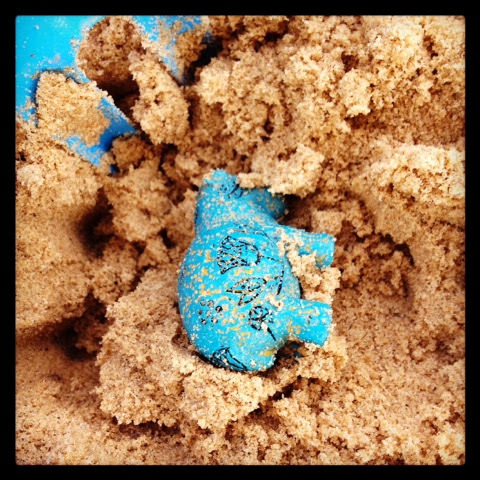 She placed her teddy on top of this image - perhaps she noted the similar shape, or perhaps she thought he might like it. Either way she went back to this little area, which also contained some ancient toys, a number of times. This exhibition was fascinating, tacile and a perfect size for children. The lights and movement were also great for Culturetot who at 6 months was alert and stimulated by the contrasts and images revolving before her, the gilded masks and bright coffins and excited chatter of her older sister. I can imagine that this would be the perfect exhibition for any primary age child interested in Egypt who wants to know more about the process of mummification and look inside real mummies. It is a great lesson in scientific investigation and showcases the use of technology wonderfully. 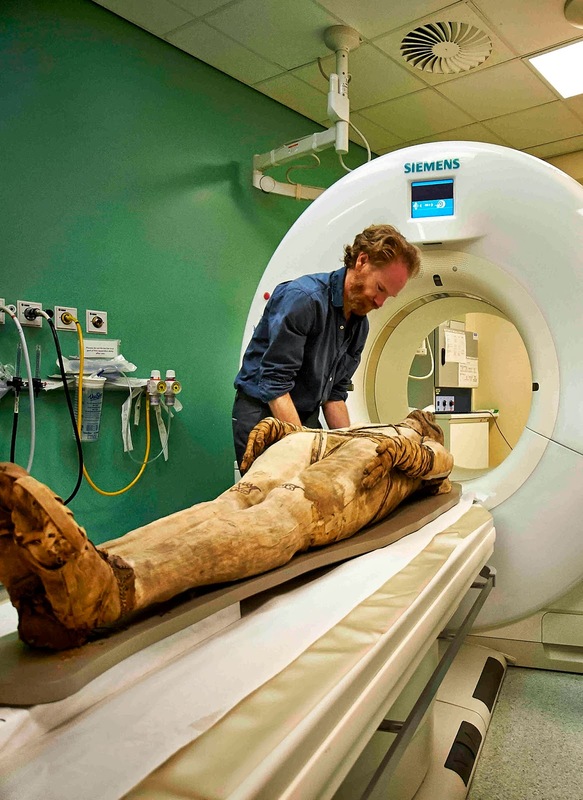 Though very clinical, there is something truly magical about the way the scans bring the ancients to life. 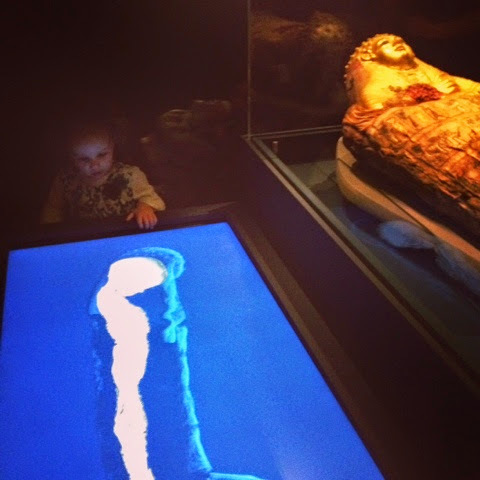 The only problem was that some of the exhibits were too high for our little Egyptologists. I've suggested that the BM put out some small stools for parents to carry round the exhibition with them. 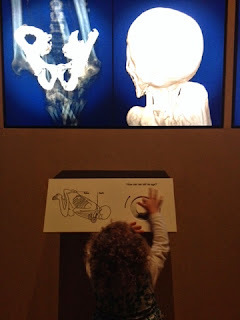 If I were taking a slightly older child to the exhibition I might print off a little image of each mummy, a couple of lines of detail about who they were and include details to spot or clues to solve about each. I think one of the best ways to make an exhibition about mummies memorable is by feeling you know them by the end. With Culturebaby I never actually get to pause and read the detail during a visit so I need to prepare before or read up afterwards. The exhibition guide for Ancient Lives is brilliant. 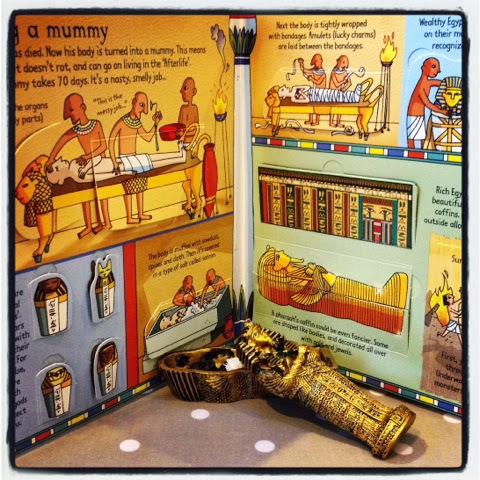 It has a wealth of detail about each mummy, gorgeous photographs and readable background on a range of related themes. To get us in the mood for the exhibition we planned a few accompanying activities, which you may also like to try. The day before we ran a little excavation. 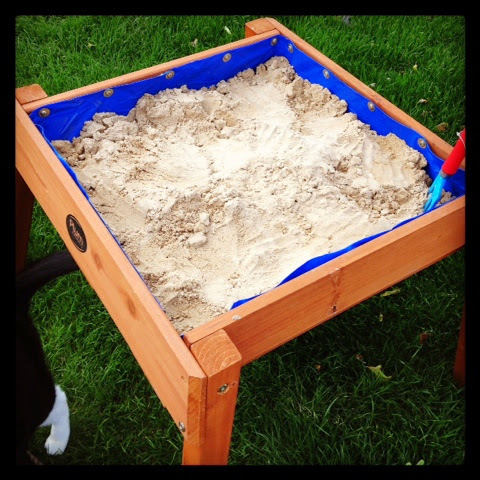 Using the wonderful handpainted educational Ancient Egyptian TOOB from Safari Ltd and a couple of other little models I have picked up, I buried a selection of amulets and figurines in Culturebaby's sand table. She excavated each of these and we named and talked about our discoveries as we went. We've already blogged about Egypt for tots here and how, that favourite of toddler subjects - animals - is a perfect way to start this journey. 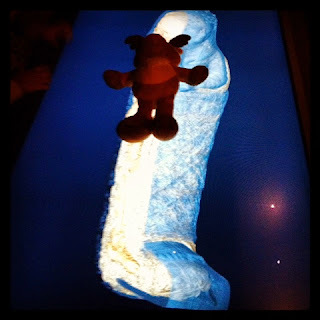 The British Museum has aptly been christened by Culturebaby 'The Egyptian Cat Museum' and after lunch we completed our Mummy-themed visit by hunting through the sculpture galleries for a selection of creatures, and again used our Safari TOOBs to find some of the 'twins' of our miniatures. This is a really simple and effective activity. There is something about the tactile nature of these models that makes them particularly perfect for a hunt like this, but postcards can also be very effective for a game of I-Spy. 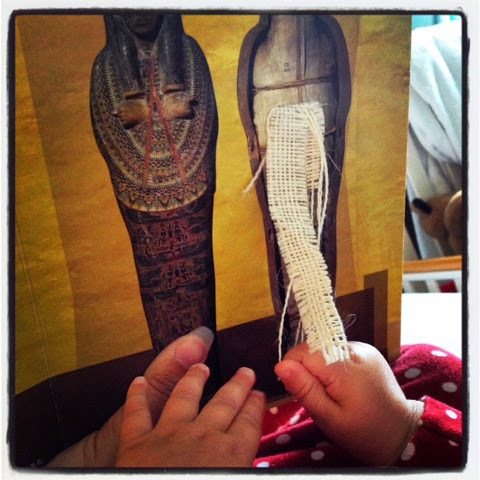 In the shop we picked up a great sticker book featuring the BM collections, which Culturebaby couldn't wait to get her little paws on, and a little model sarcophagus complete with removable bandaged mummy. 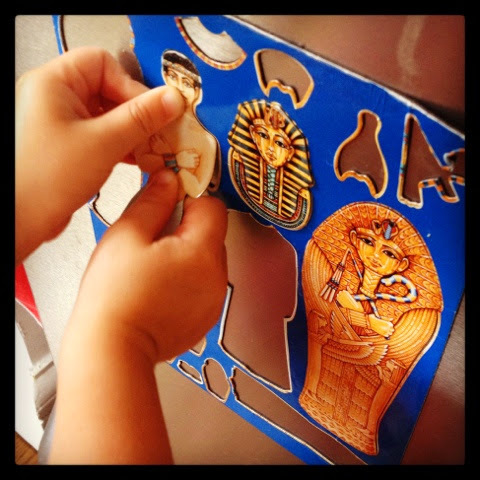 Along with her great Tutankhamun magnet set we found in the Manchester Museum shop, she's rather enjoying playing with him at present, but he is soon to star in a homemade shoebox tomb for Tutankhamun to prepare for a trip to see Harry Burton's photos at the Ashmolean. 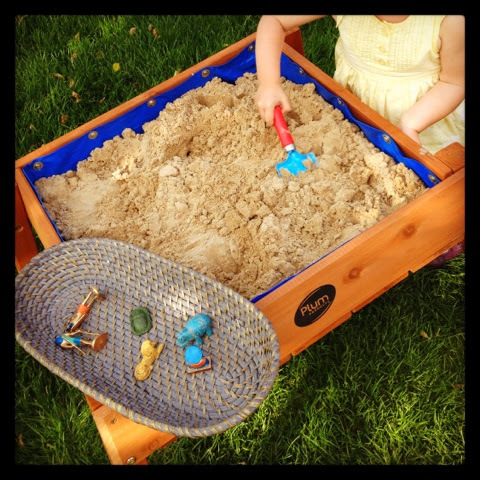 You can equally make a simple sarcophagus and mummy from playdoh or clay and cloth. Older children might also want to have a go at embalming on this great little animated programme from Manchester Museum or this interactive game on the BBC History site. I have previously bemoaned the lack of great Egyptian books for babies and toddlers, and this is still the case, however there is a small but brilliant selection available. You can see the reviews for 1. One Blue Hippo, An Ancient Egyptian Counting Book, 2. Tickle Tut's Toes by Julie Appel and Amy Guglielmo and 3. We're Sailing Down the Nile, a Journey Through Egypt by Laurie Krebs and Anne Wilson by clicking here. Beyond these I was delighted to discover a trio of beautiful books on the topic for slightly older readers. I hold Usborne books at least partially responsible for my choice of degree. As a child I fell in love with their young tour guides who, through detailed and stunning illustrations, drew me into their Roman and Medieval worlds, from which I suspect I never fully emerged. I would have been absolutely delighted by the brilliantly designed and hugely engaging Usborne Look inside series, with their plethora of flaps to lift, facts and detailed cartoon-like illustrations. Their brand new Look inside Mummies and Pyramids has been published this month and we were treated to a sneak preview. Guaranteed to capture any child's imagination, the little Egyptologist is taken on a tour of the pyramids and the Valley of the Kings, invited to examine a funeral procession and peep inside containers galore, and there is a fanstastic double page spread on the process of mummification - an ideal read to accompany this exhibition. This book works on a number of levels for a range of ages. Culturebaby has been captivated by the flaps and through a discussion of what she uncovers she has taken a surprising amount in... Usborne has also produced one of Culturebaby's current favourites, a story set in Egypt entitled In Egyptian Times. This simple tale charts a day in the life of a young brother and sister who get the opportunity to see the Pharaoh pass through their town. It's one of the best early history books I've found for a two year old. Finally, for the primary school age child, Jessie Harland's How the Sphinx got to the Museum is a clever introduction to the complex journey an artefact makes from creation to exhibit. Following Hatshepsut's Sphinx from Nubian quarry to the Metropolitan Museum in New York, this book answers very important questions about how exotic objects end up in museums and all the work that goes on by so many different experts to get them there. Culturebaby's inquisitive six year old friend loves this series of books (which also include a journey of a dinosaur and a meteorite). Disclaimer: We were invited to the British Museum press opening and given a copy of the exhibition guide for review purposes. The BM also provided the photographic images noted as such. 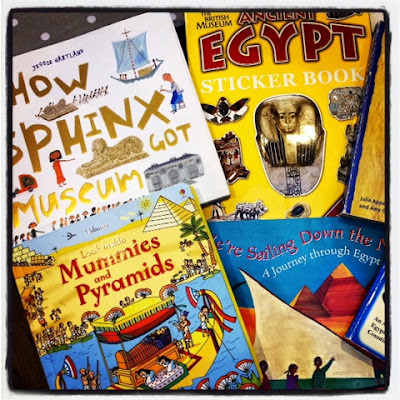 Usborne kindly sent us their new Look Inside Mummies and Pyramids to review, on request Safari sent us their fabulous Egyptian TOOB via their UK distributor Asobi Toys, and PGUK sent us Blue Apple's How the Sphinx got to the Museum. All other materials are our own, as are all our views!